The Indoor Hydroponic Garden at Samuel E. Hubbard Elementary School had over 1,000 visitors after it was first created in February of 2015. The visitors included Pre-K through 5th grade students, teachers and parents, staff from the Monroe County Board of Education, and various community members. The Tiger Sprouts, a group of 12 Second Graders, maintained the garden and harvested the produced under the supervision of Rebecca Wachtel. The Indoor Hydroponic Garden was also used by classroom teachers for mini-field trips to enhance the science and math units. As our garden grew, so did our knowledge. The Tiger Sprouts gained first hand experiences with the concept from “seed to table." They planted the seeds, observed the seeds germinating, monitored plant growth, and harvested lettuce to create their own personal salads. Special speakers included Karen Leverette, Hubbard parent and Registered Dietitian Nutritionist, spoke to our Tiger Sprouts about healthy eating habits and the importance of trying new foods. The Tiger Sprouts designed a trellis using the STEM process for the cucumber plants. Teams of students designed tomato support systems out of stems and twine. They experimented with different growing mediums. Our biggest harvest day was used to treat our teachers to a special salad bar the Friday before Spring break. 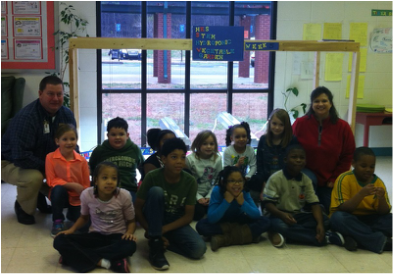 Smaller harvest days were used by homeroom classes as part of their PBIS (Positive Behavior Incentive System). Mrs. Rebecca Wachtel would like to thank the second grade teachers, Ms. Davis, Mrs. Smith, Mrs. Lewis, and Mrs. Smith for their flexibility and support in allowing the second grade Tiger Sprouts to participate in lessons and reporting back to their homerooms.